At 1.00pm we had 2 people attending the apiary – I appeared a bit later having been engrossed in my own laying worker issues. We unloaded 10 new, 6inch deep roofs, purchased by the association and built up for us by Chris. As 3.00 pm the attendee level remained at just the 3. With Richard C and Brian we had a busy session to check the hives, a little bit more feed to top up earlier feeds, change the roofs and remove spare supers to the shed. 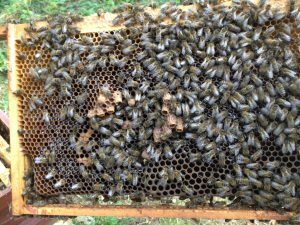 In the hives we found 2 full hives without brood – at any stage. From the picture you can see a group of emergency cells, many emerged but it does not look like they have swarmed. It is interesting that this queenlessness is 2 weeks after MAQS was administered and must have occurred at that time due to there being no sealed brood now. 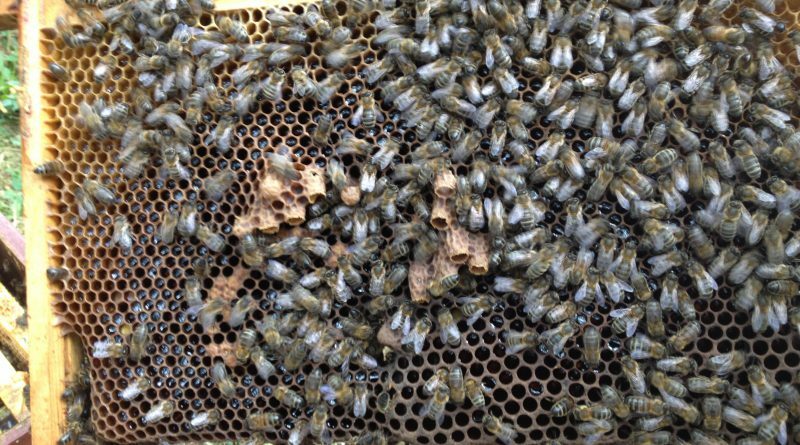 Also – we have 6 nucs of varying strength – 1 of which had a queencell as above and is not showing signs of a laying queen yet. 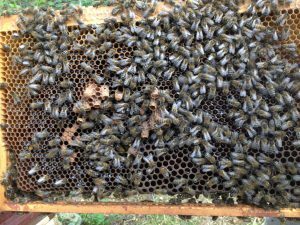 The 3rd Sunday meeting will be a time when we have to make decisions on these non-laying colonies, so that we can go into winter in good shape.